We have only few days to work for our New Year’s holiday in Japan! Unlike Christian countries, New Year day and few days before and after are the Seasonal Holidays in Japan. 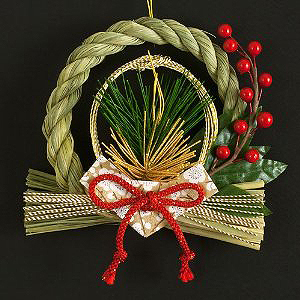 Still, we have many things related to Christmas in Japan which remind us that the year is drawing near to the end. It may sound funny to you that there are many things in Japan at this time of the year related to Christmas because according to ‘Annual Statistics of Religion’ (Shukyo Nenkan) issued by the Agency for Cultural Affairs, less than 1 % of the population in Japan are Christians. Such phenomena are caused, of course, there should be many causes and reasons, certainly specific after the Second World War. One of the major reasons should be is that Christmas represents a certain time of the year. Now you can find ‘Christmas’ as one of the season words of the year in HaikuW dictionaries. You can find an interesting article written about Christmas cakes in Japan by one of our members of Navis Argenti, at ‘Saionji Net’ to find out the Christmas in Japan. Not because it’s Christmas time that this season’s phrase is related to reindeer-like deer, a Pere David’s deerW or a mooseW… The phrase came from China long time ago, before Christmas was known in Japan. ‘Sawashika no’ means Sawashika’s. ‘Sawashika’ is not at all common in Japan, in fact, we had to look up Japanese-Chinese dictionary to see what it is. 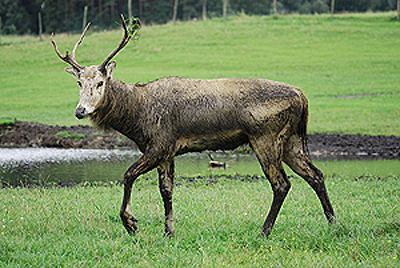 It is Pere David’s deer, a deer that only lived in China wild and was thought to be a sacred beast. There is another description about this ‘Sawashika’, saying that it is a moose which you can’t also find in Japan. It should have been difficult for some to imagine that the phrase describes such time of the year from this phrase with animal that doesn’t exist in Japan. So why did they use it? We don’t have the right answer but we can estimate from the 72 season phrase from our origin, the Chinese 72 seasons. ‘Sawashika’ , ‘Shifuzo’ or Père David’s deer. Photo from ‘Wikipedia, Japan‘. You can find that the same phrase is used in China to express the same time of the year! The phrase continues with ‘tsuno otsuru’, meaning that the antler sheds or antler released. We are not sure whether the Pere David’s deer starts to shed their antlers at this time of the year but with moose, we came to a data that some starts to shed their antlers at this time of the year. We have Shika deerW in Japan which is a common deer in Japan. You can see them quite easily if you go out into the countryside, even in mountains and forest areas of Tokyo Metropolis. The Shika deer start to shed their antlers in February to early April, one of the early Spring scene recognized in Japan from the old days. 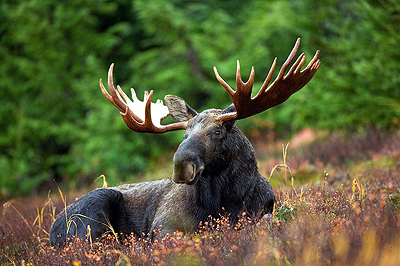 A moose which you can’t find in Japan…. If we look at the wild Shika deer in Japan, we would have to wait for another month or so for them to shed their antlers, knowing spring is gradually here but if we know that the Pere David’s deer or the mooses’ antlers are starting to shed their antlers, even if we have never seen them, our ancestors may have thought that the Spring has started to arrive in countries far away from Japan which gradually will arrive in Japan, not so far off. 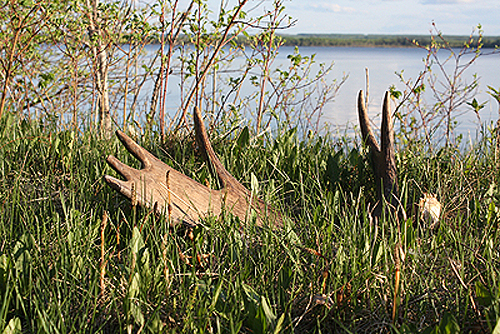 Shedded moose antlers. A vision the old Japanese imagined as the earliest Spring’s arrivial in countries far away from where they live…. The deep longing thoughts for the arrival of Spring may have been a thought to get away from the negative qiW, the negative power, of the season which ended its peak on the Winter solstice few days ago. You will find that the deer in OnmyodouW or in I ChingW teachings that they are animals with positive qi. The nature of shedding their antlers were thought to be getting rid of the negative qi within their body from the the peak negative qi of the Winter solstice that the positive qi deer have been flooded in. You can see by the kanjiW used for the word for ‘otsuru’ which originally means ‘to let go of’ or ‘to release’ and is read ‘toku’, rarely read ‘otsuru’. The kanji usually read ‘otsuru’ is different to the kanji used here, meaning simply ‘to fall (off)’ that the general meaning of the word ‘otsuru’ has double meaning of a practical matter of the deer’s antlers shedding. And emotionally and spiritually, releasing the negative powers done by the deer shedding their antlers. A phrase expressing that the Japanese already longing for the Spring’s arrival. ‘Senryo’. A aplnt with wealthy name! 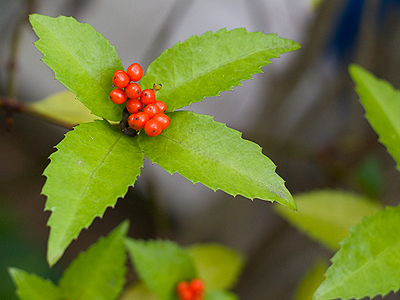 Ardisia crenataW, ‘Manryo’ in Japanese is known as Christmas berry or Australian holly in Western countries. Sarcandra glabra, ‘Senryo’ in Japanese, is like Christmas berry, a family of [Wmyrsinaceae]. 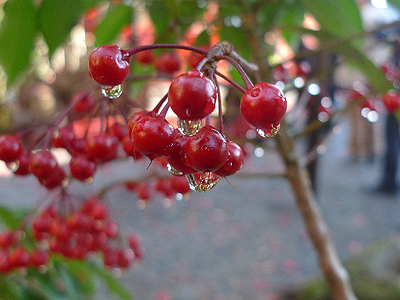 They both look alike, compact shrubs often seen in Japanese gardens or in pot plants with glossy red fruit in clusters at this time of the year. The name of these plants are currency units of Edo periodW, ‘Sen-ryo’ meaning 1,000 Ryo and ‘Man-ryo’ meaning 10,000 Ryo. It is hard to tell how much 1 Ryo is in present Japanese Yen but according to many books and reports, it is considered as about 300,000 to 400,000 Yen (about 300 to 400 US Dollars). You can see now that these plants have ‘wealthy’ names in Japanese. They were thought to have been named so because they fruit at this time of the year, in glossy red, a colour of ‘life’. New Year decoration with ‘Senryo’ (or Manryo?) for entance door. Photo from ‘Amazon, Japan‘. You can see that many New Years’ decorations with these plant berry branches or pot plants selling to decorate house entrance at this time of the year wishing that the plant would bring in the luck.